It started with a near derelict house, but after many months of repair and restoration this 3rd generation 1850's bungalow has came back to life as the Adelaide Hills Business Centre - a modern business collaboration and business hub. Since opening in October 2014, AHBC has grown to nearly 100 members, has regular business Meetups, Events, Programs and people booking Digital Boardrooms, Media Production Studio and using the 24/7 Coworking Spaces. 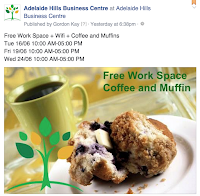 Local Adelaide Hills resident and business owner, Gordon Kay identified a centre that provided personalised business support was much needed in the Adelaide Hills. “On reviewing the ability to obtain local business assistance we found that the Regional Development Australia (RDA) and the Adelaide Hills Council provided strategic planing and development rather then a personalise service for SME owners." In this post you will find a list of activities and services we've put in place to create awareness of your local business centre. Without doubt glowing green AHBC sign by night catches the eye. When it was first opened passes-by would come in for a quick look after driving past at night. Flags are also prominent outside and on public open days, the 'Come and Try' sign is out. Thank you Plasma-Art for this great concept. 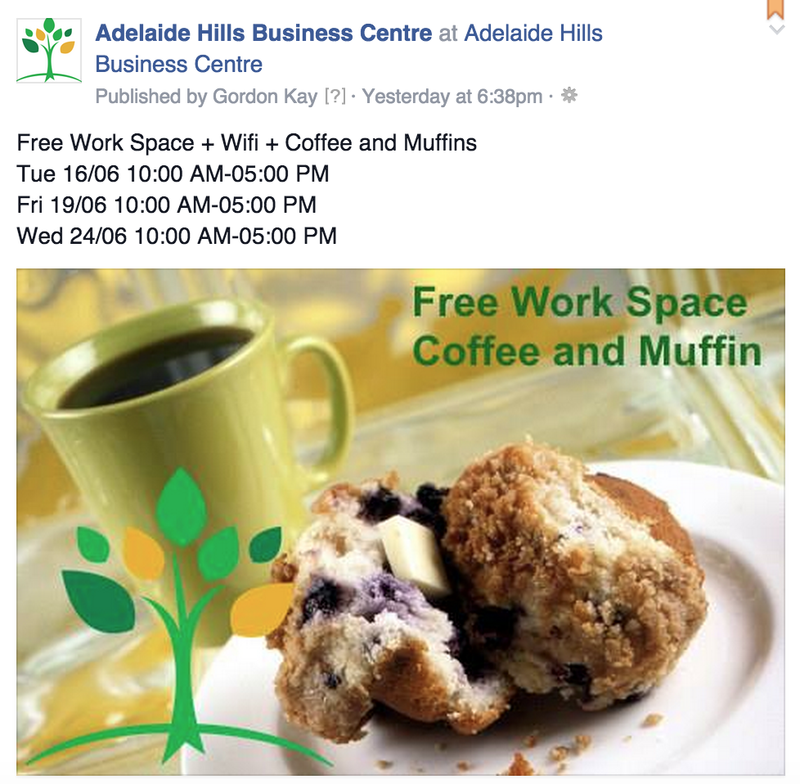 AdelaideHillsBC.com.au hosts everything you need to know about AHBC, serving as a central hub to the Adelaide Hills. We are easily found under Google and your can even talk a virtual walk through the centre using Google maps. 'Come and Try' days are designated days where anyone is free to drop in and experience what's on offer at their local business centre. We find that some people like to have a quick tour, while others bring a laptop to get some work done. Free workspace, Wifi and Coffee is always on hand. 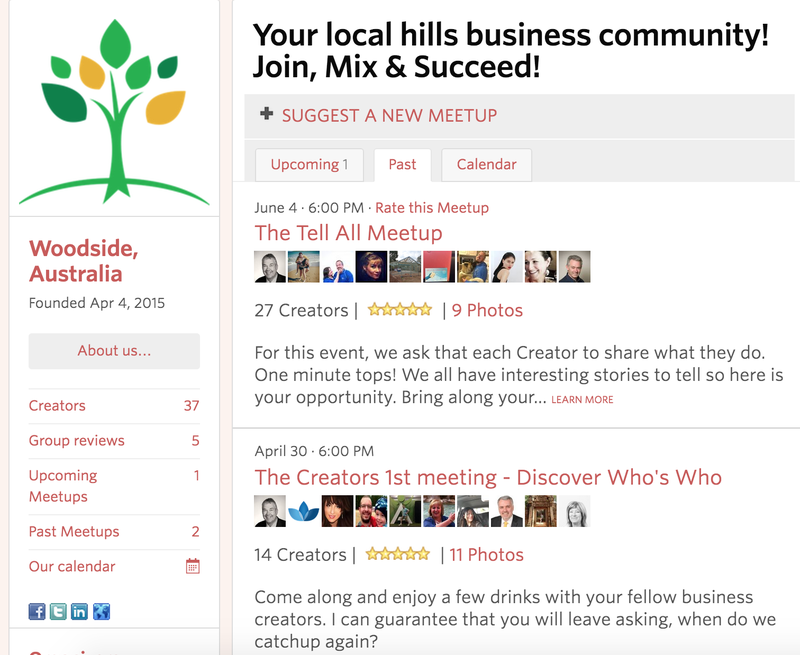 To date there has been two AHBC Business Creators Meetups Events. 'The Who's Who' and 'The Tell All Meetup' (Check out the photos here). Each event gave attendees a chance to share ideas, experiences and connect with like-minded business people who live in the same area. Our next Meetup on Thursday 23rd of July at 6pm and features Adam Troyn, 2015 iAward winner for his world class cloud product, Kampus. 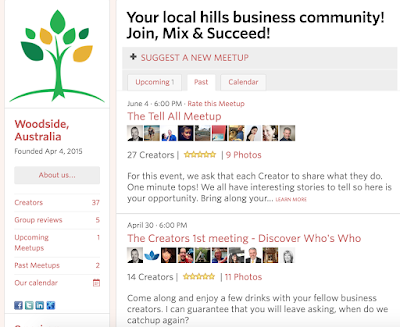 Local business people can join the Adelaide Hills Business Creators Meetup Group and attend any of our Upcoming Events. The Ruby Tree Club is about success by association offering our women in business with a supportive business networking community. Most meeting also include a guest speaker who will shares their corporate knowledge. We are very lucky to have Di Thompson as our Ruby Host. Join today, click here. 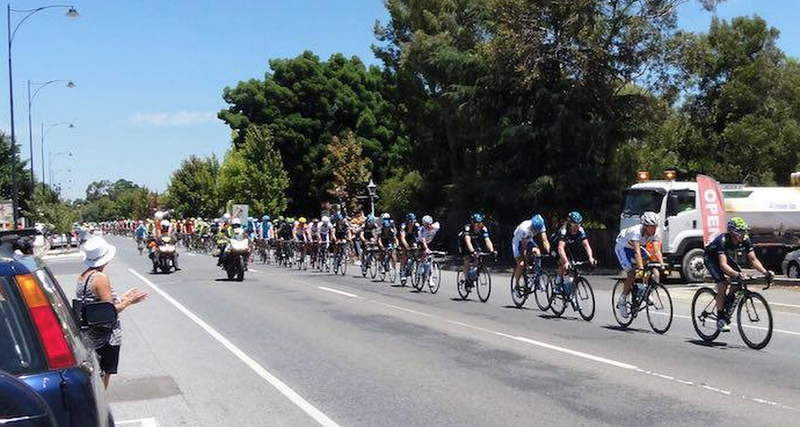 In January AHBC opened especially for the Tour Down Under cycling event and Woodside street party. It helped bring through lots of new people who never knew we existed. AHBC was glad to offer free support to bushfire affected businesses in January and February 2015. Obviously not a planned activity but it resulted in the AHBC providing relief for those impacted by the fires. Not surprisingly, Facebook has proven to be the primary means of communication with the growing AHBC community. The Facebook page keeps followers informed of everything that's happening at AHBC - including local business news, events, programs, meetups. It also provides broader business news and advice that we think will be helpful to the community. At the time of writing we are up to 748 page Likes. 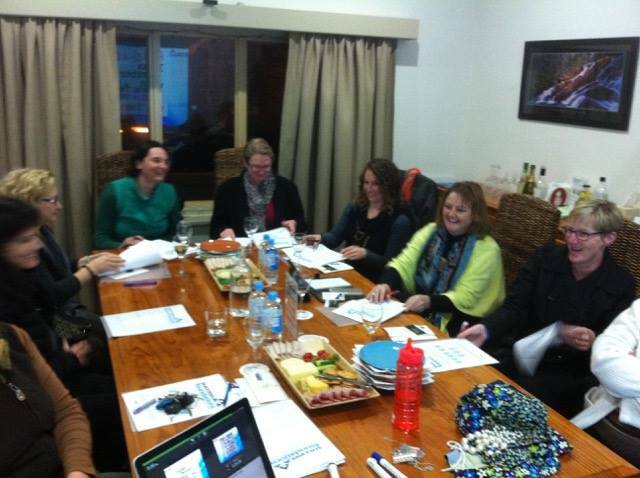 Initially many updates were 'boosted' in order to target business people living in the Adelaide Hills area. Twitter / Linkedin / Google + are used regularly to share updates to our followers who are not on Facebook. We've found Buffer helpful in syndicating messages across each platform. Subscribers of 'In the Know' receive local business news, events, programs and member only specials, direct to their email. We only email once a month as we know people have lots so we keep it short and to the point. Our blog is used to distribute valuable content to the AHBC community which helps us stay in touch with existing members and increase our brand awareness. Our content is often shared on social media by our community and by the people and businesses who are featured. Local Knowledge is a segment designed to help local business owners learn from other successful business owners in the Adelaide Hills using a mix of news and case studies. AHBC allows guest authors to share their expertise and knowledge about a range of business topics. Thank you Matt Pepper from Pepper Content and Nan Barrett from Word Solutions. 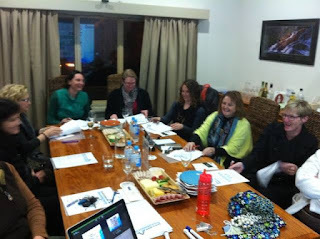 Our object is to collaborate with other organisations and groups that share our goal to assist people in business.